Angels & Airwaves are back! In celebration of the band's 2006 album, We Don't Need To Whisper, the musical brainchild of Tom DeLonge are releasing a special EP of new, acoustic versions of four fan favorites. Check out the We Don't Need To Whisper – Acoustic EP details below! The new Angels & Airwaves EP is now available for download exclusively from DeLonge's To The Stars site here. The release will be available on music streaming services beginning this Friday, August 25, and pre-orders for the acoustic EP are on iTunes here. AVA—who last released the Chasing Shadows EP in 2016—are currently in the studio working on a soundtrack to DeLonge's upcoming Strange Times film, the anticipated cinematic extension of the musician and author's science fiction novel series of the same name. In the meantime, DeLonge says he wanted to have some fun by issuing new, stripped-down versions of WDNTW tunes. As previously reported by AP, DeLonge teased that a batch of fresh AVA material was on the way earlier this year. 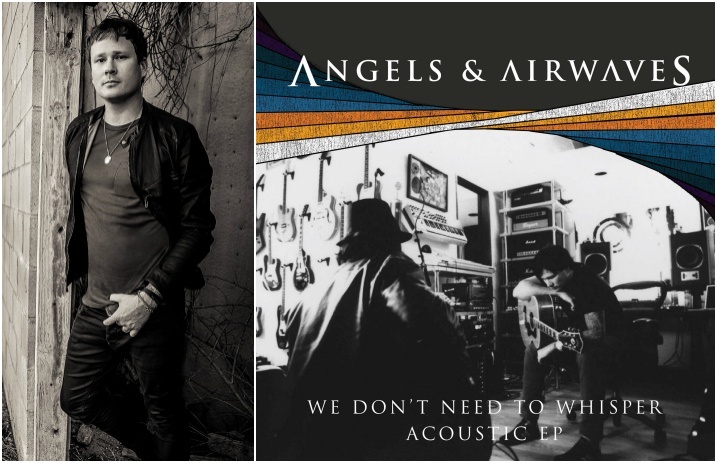 The Box Car Racer founder and ertswhile Blink-182 member clearly wasn't messing around, and the four rejuvenated selections on We Don't Need To Whisper – Acoustic EP showcase DeLonge's imaginative arrangements along with a more mature, soulful vocal style. On a more somber note, DeLonge is dedicating the new AVA EP to producer Jeff “Critter” Newell, who passed away in 2012. In addition to the four new songs on the EP, take a look at a new lyric video for “The Adventure,” below, which features rare footage from the band's original We Don't Need To Whisper studio sessions in 2005 and 2006. The Adventure (Lyric Video) by Angels & Airwaves on VEVO.